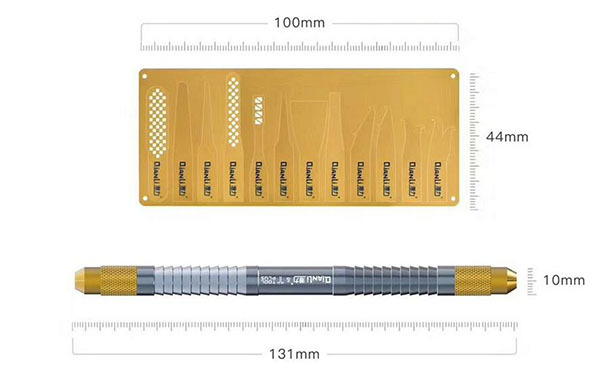 QIANLI 007 008 009 Chip Remove Pry Knife including QIANLI 007 Remove CPU Double Crescent Knife, QIANLI 008 Black Glue Removal Tool and QIANLI 009 12in1 BGA Chip Remove Tool Pry Knife IC Chip Remover. 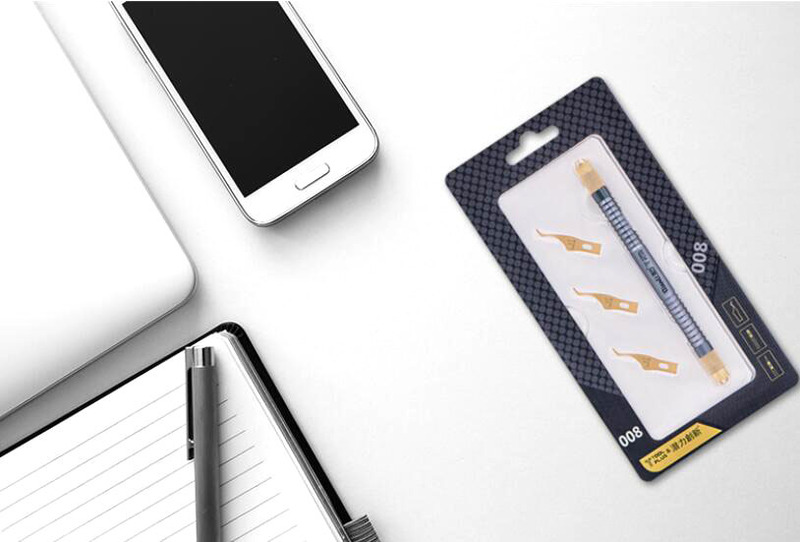 Equipped with a sharp crescent blade (J Curved Blade), used to remove glue from hard disk and CPU of your phone effectively. Designed in grip-reinforced screw texture, the item can provide friction for you during the glue-removing process, which helps to anti-slip. 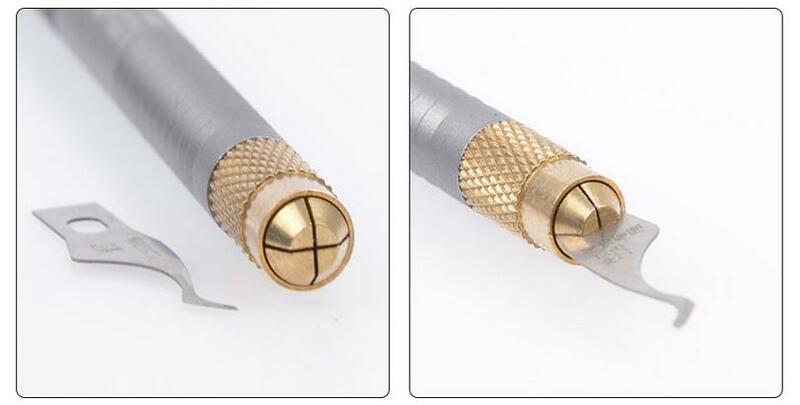 The sharp crescent blade can be assembled in both ends of the pry knife optionally. What's more, it is simple for you to assemble the knife. Solve the problem many see the CPU is a headache of the teacher, did not dare to hurt, afraid of bad, with our this artifact, are said to the CPU, SO EASY! 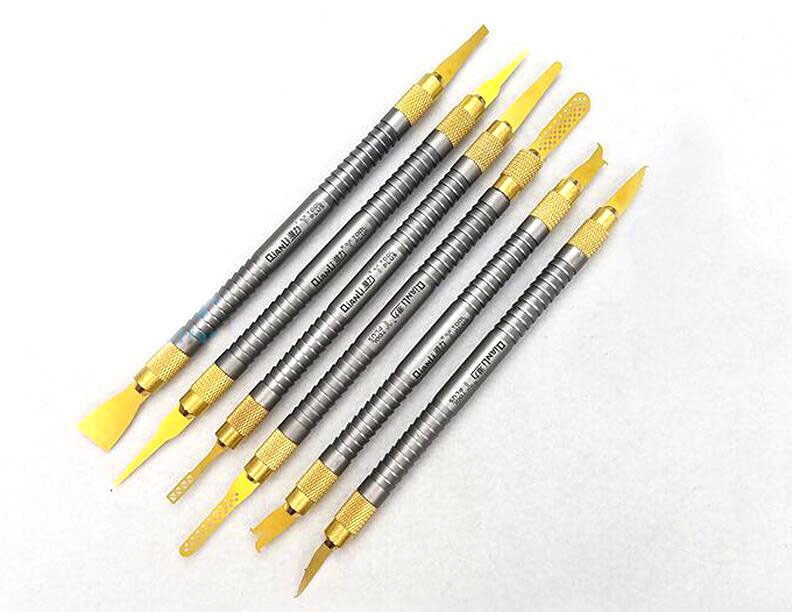 The trick in special materials, ultra-thin super elasticity, when the CPU tin melting point, the blade can be directly inserted into the CPU, step by step, the CPU is so relaxed and safe removed. With Retail box, great for your store or resale. Hand polished, clean glue quickly and don't damage mainboard, easily solve black glue. A special process handle,sandblasting can produce a shine in the alloy surface and fine texture with frosted effect,alloy in point solution after applying a current in the metal surface to form a colored oxide layer. Handcrafted and polished, the blade adopted single-edge cutting technology is designed specifically for removing black glue without causing damage to motherboard. 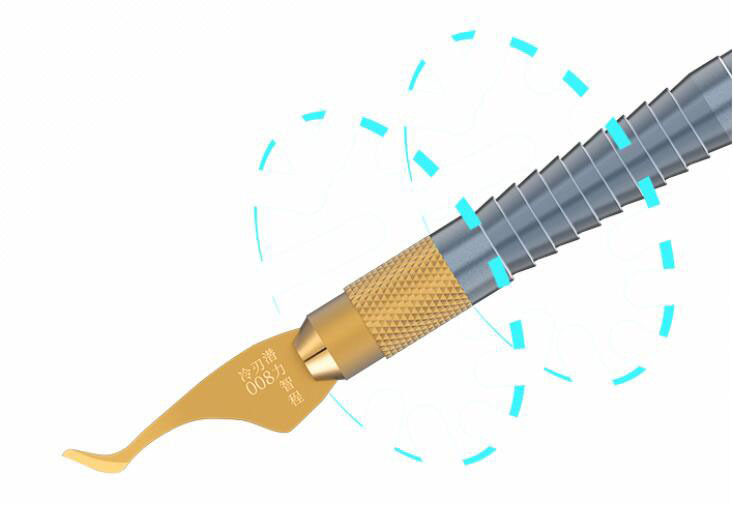 Adopted cryogenic treatment technology, the blade with high carbon content becomes solid, resilient and precise, which is a good choice for you to remove black glue. The delicate blade can be assembled in both ends of the cold knife optionally. What's more, it is simple for you to assemble the knife. Adopted single-edge cutting technology, the blade polished precisely is disigned specifically for removing black glue without causing damage to motherboard.